Ni Zan (倪瓚, 1301–1374), courtesy name Yuanzhen (元鎮) and pseudonym Yunlin (雲林), was a painter and poet of the Yuan Dynasty. He was a native of Wuxi (無錫) in the Lake Tai region. 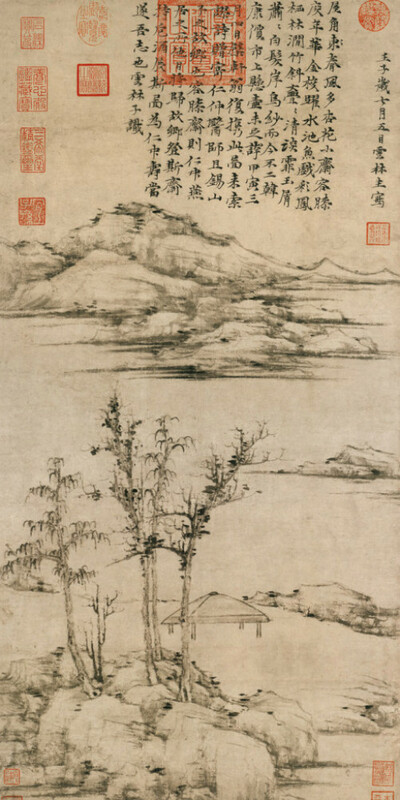 Instead of serving the foreign Mongol dynasty of the Yuan, Ni Zan chose to live a life of retirement and cultivated the scholarly arts (poetry, painting and calligraphy). He collected artistic works of the past and associated with those of a similar temperament. Ni Zan was characterized by his contemporaries as particularly quiet and fastidious, qualities that are found in his paintings. 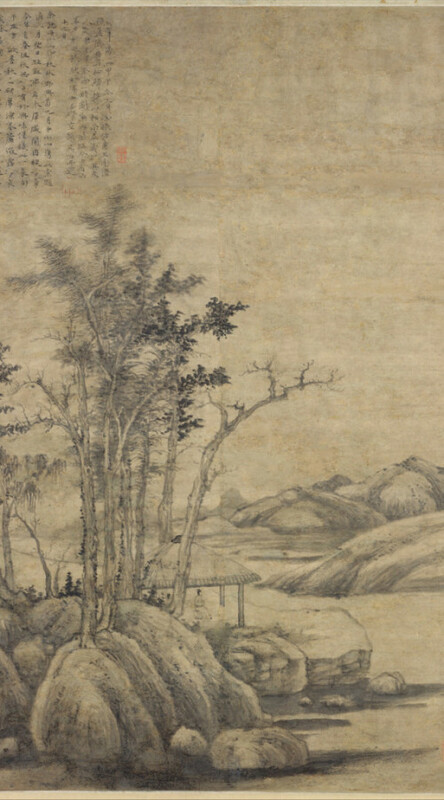 Toward the end of his life, Ni Zan is said to have distributed all of his possessions among his friends and adopted the life of a Daoist recluse, wandering and painting in his mature style in the Lake Tai region near his hometown. 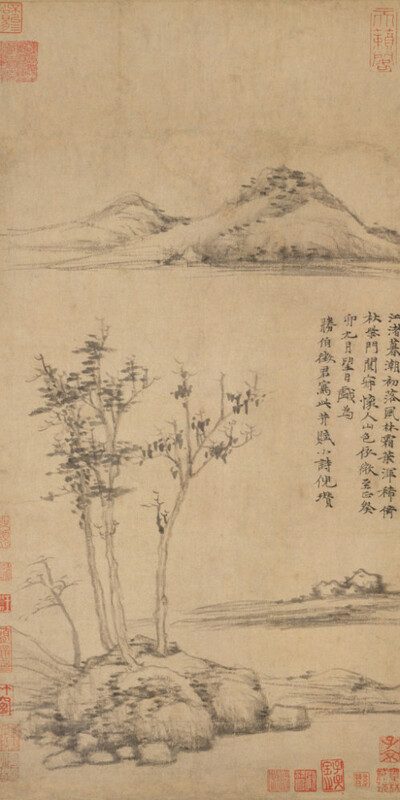 The art of Ni Zan and his peers in the Yuan dynasty was opposed to the preceding standards of the Southern Song academy, whose art immediately appealed to the eyes through obvious displays of virtuoso brushwork and a convincing pictorial reality. Ni Zan’s new style demanded concentrated viewing so that the larger and, in fact, more complex plays of ink could be perceived. 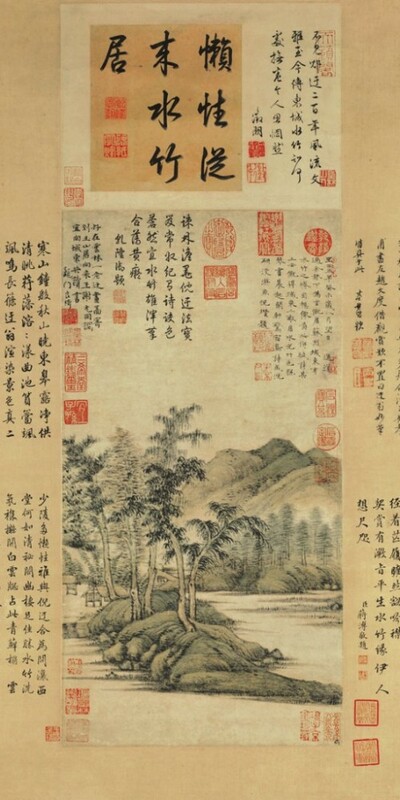 Generally it may be said that in his paintings, usually landscapes, he used elements sparingly, used ink monochrome only, and left great areas of the paper untouched, which suggests the expanse of water. There is often a rustic hut, without any further suggestion of human presence, a few trees and other scant indications of plant life, and elemental landforms with a somber quiet throughout. These sparse landscapes defy many traditional concepts of Chinese painting. Many of his works hardly represent the natural settings they were intended to depict. Ni Zan advocated that painting should be used to express personal emotions, rather than to depict physical resemblance. 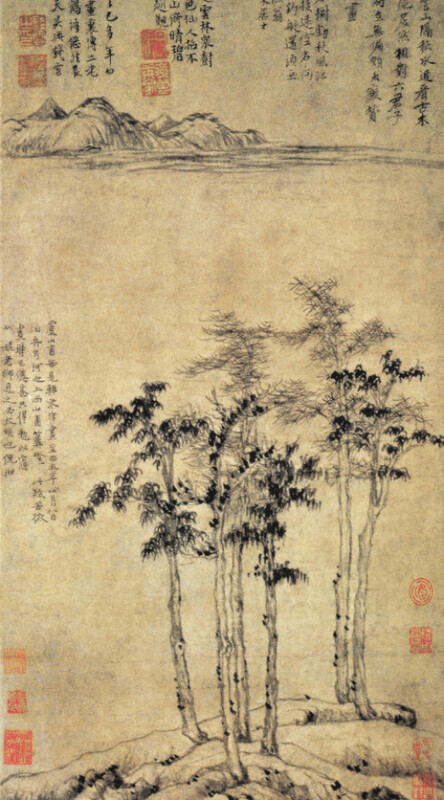 It was in 1372 that he painted the Rongxi Studio (容膝齋圖), which epitomizes his style. Ni Zan is regarded as one of the “Four Great Masters of the Yuan (元四家)”, alongside Huang Gongwang (黃公望, 1269–1354), Wu Zhen (吳鎮, 1280–1354), and Wang Meng (王蒙, 1308–1385).